Manitoba Premier Brian Pallister has made major changes to his cabinet at the midway point of his mandate, swapping ministers in Health, Finance and other high-profile portfolios. Manitoba Premier Brian Pallister has made major changes to his cabinet roughly midway through his mandate, swapping ministers in Health, Finance and other high-profile portfolios. Pallister moved Health Minister Kelvin Goertzen to Education, Finance Minister Cameron Friesen to Health and Families Minister Scott Fielding to Finance. Heather Stefanson moves to Families from Justice and Cliff Cullen moves to Justice from Crown Services. 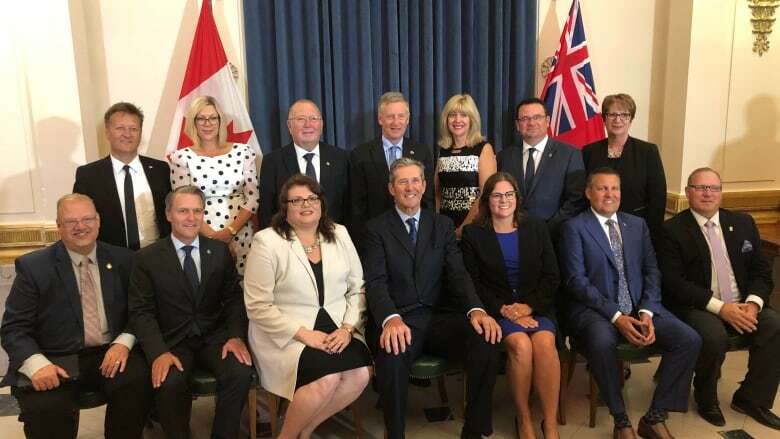 One backbencher, Colleen Mayer, was promoted to cabinet in the Crown Services role, and one minister, former Education head Ian Wishart, was demoted to the backbench. "It's a refresh and it's a pretty normal practice, I think, in most governments provincially and federally," Pallister said of the shuffle Wednesday. "We've got some people who are very much up for the challenges that lie in front of them." Pallister said the changes are a "strategic repositioning" as the Progressive Conservative government tries to reduce the deficit and restore public services before the next election in October 2020. The Tories have promised to end a string of deficits, started by the former NDP government, before 2024. Goertzen's departure from Health follows sweeping cost-cutting measures, including the closure of three hospital emergency rooms in Winnipeg. Now in Education, he'll be tasked with a review of the province's elementary and high school systems. "We're going to make the education system work better for our children," Pallister said. The Opposition New Democrats said Goertzen's move is a bad signal for schools. "He's going to be seen as the face of major cuts to the education system," said NDP health critic Andrew Swan. Wishart said he did not ask for the demotion from cabinet and plans to run for re-election in 2020. He has been charged with helping Goertzen with the school review and said he welcomes the role. "The (review) is probably the most significant change in education in a generation," he said. Mayer, the only new minister, will be tasked with fixing troubles at Manitoba Hydro. Board members resigned en masse earlier this year and the Manitoba Metis Federation has launched a lawsuit over a proposed benefits agreement the government quashed. Mayer, who is Metis and a member of the federation, said she hopes to find solutions. "There's lots of challenges for sure, but there's great opportunities as well, and I look forward to rolling up my sleeves and getting into that." Federation president David Chartrand said he has met Mayer before and welcomed her addition to cabinet, but also believes the government's approach will continue to be controlled by Pallister. "If the premier doesn't loosen up the leash, it'll mean that we're still stuck with a centralized system where these ministers will meet with us, but they'll have no power or authority to make a decision," Chartrand said. Heather Stefanson (Tuxedo) — Families, deputy premier. Cameron Friesen (Morden-Winkler) — Health, Seniors and Active Living. Kelvin Goertzen (Steinbach) — Education and Training, government house leader. Cliff Cullen (Spruce Woods) — Justice, attorney general. Scott Fielding (Kirkfield Park) — Finance and minister responsible for the civil service. Colleen Mayer (St. Vital) — Crown services. Reg Helwer (Brandon West) — legislative assistant to the minister of finance. Greg Nesbitt (Riding Mountain) — legislative assistant to the minister of health, seniors and active living. Brian Pallister (Fort Whyte) — premier and president of the executive council, minister of Intergovernmental Affairs and International Relations. Jeff Wharton (Gimli) — Municipal Relations. Eileen Clarke (Agassiz) — Indigenous and Northern Relations. Ron Schuler (St. Paul) — Infrastructure. Ralph Eichler (Lakeside) — Agriculture. Blaine Pedersen (Midland) — Growth, Enterprise and Trade. Cathy Cox (River East) — Sport, Culture and Heritage. Rochelle Squires (Riel) — Sustainable Development and minister responsible for Francophone affairs and status of women.